Workforce Solutions of the Coastal Bend (WFSCB) receives funding from the Texas Workforce Commission to provide subsidized child care services for low-income families within its 11-County region (Aransas, Bee, Brooks, Duval, Jim Wells, Kenedy, Kleberg, Live Oak, Nueces, Refugio, and San Patricio counties). This funding makes it possible for parents to maintain jobs or attend school or participate in training activities which enable them to enhance their quality of life and the lives of their children. 0 – 12, preventing circumstances leading to abuse, and promoting health and safety. For more information, please contact us at 361-882-7491 ext. 1932 or info@workforcesolutionscb.org. Enrollment for Child Care Services continues to be closed!! Workforce Solutions of the Coastal Bend enrolls customers from its Wait List. 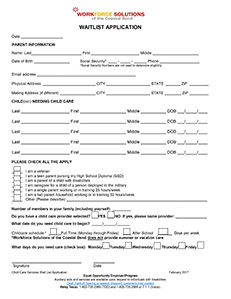 Customers who need full-time child care services may complete a Child Care Wait List Application to have their name and contact information added to the Wait List. As funds become available, customers on the Wait List will be contacted by Child Care staff and asked to submit the appropriate documents to determine their eligibility status. 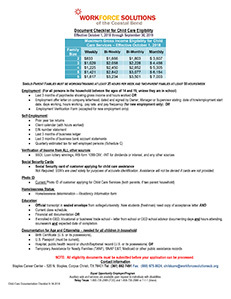 Click Below To Download the Child Care Wait List Application (complete form, save the file and then email to info@workforcesolutionscb.org). and view the Documentation Checklist (list of required documents). Parents participating in the Child Care Services Program receive financial assistance to help pay for their children to attend a State licensed child care center, licensed child care home, or a listed relative child care provider. Child care services may be provided for children ranging in age from “0” to “12”. Studies consistently show that children who receive quality care at an early age perform better overall. Moreover, parents who know their children are well-cared for are more focused and productive on the job. If Employed: At least 6 of your most recent pay stubs or self-employment records (last 3 months). In in School/Training: Current school schedule or proof of enrollment. Records of Other Sources of Income: Temporary Assistance for Needy Families (TANF), Supplemental Security Income (SSI), and Child Support. Documentation of Citizenship and Age: Birth Certificates or Medicaid.